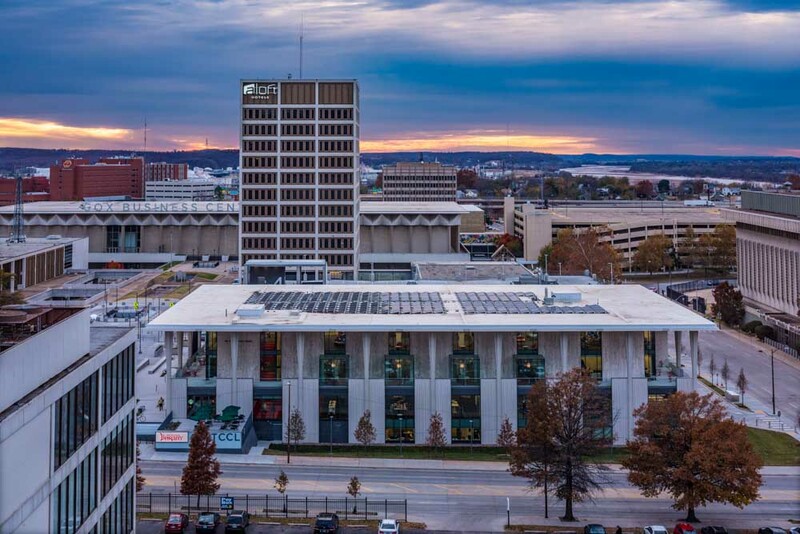 Since 1963 much of the Central Library in Downtown Tulsa has remained unchanged. 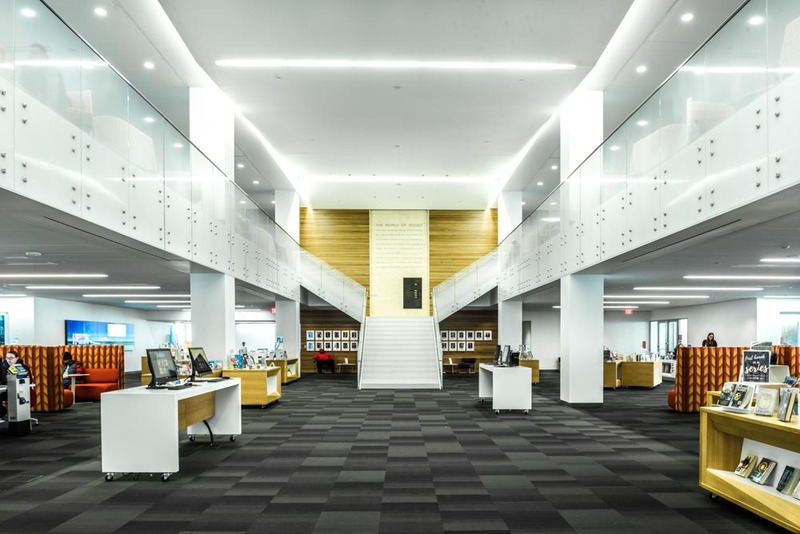 Although impeccably maintained, the evolving duties of the library required that the city’s main hub receive a major renovation. 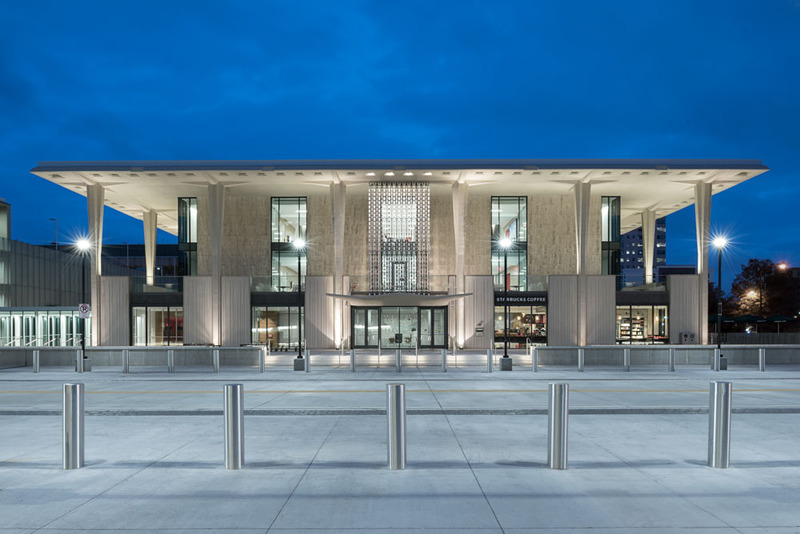 In the summer of 2012, the Tulsa City/County Library System hired MSR Architects and MODUS Engineering to design a complete gut retrofit of the iconic Central Library. MODUS was challenged with several design criteria from the beginning. 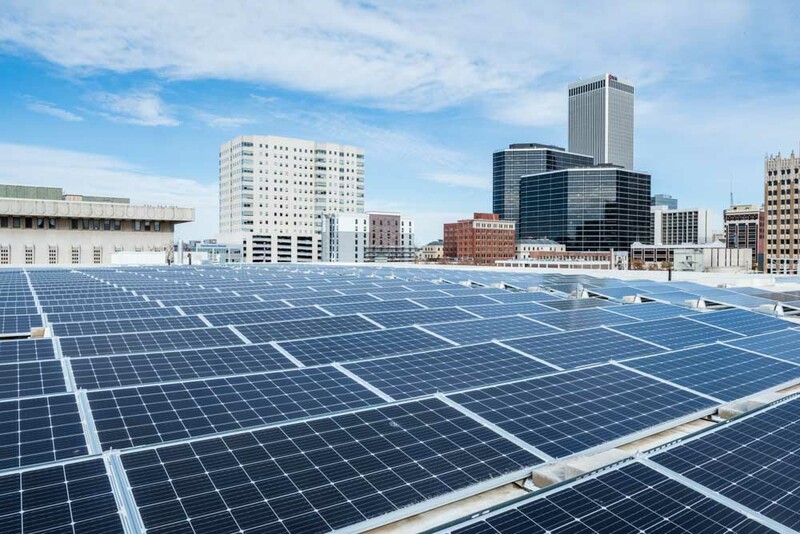 Energy efficiency was a top priority and meant to transform the library into a good steward model for downtown Tulsa. The existing building contained mechanical rooms on each floor. The library wanted to re-claim these areas for patron use. To fulfill this request, a more centralized HVAC system was implemented. The HVAC system also had to limit its impact on the library’s acoustics throughout the reading areas. Additionally, there was a desire for acoustic control in both conference and auditorium spaces. The library had recently purchased two very nice pieces of equipment out of necessity. These pieces of equipment were an all stainless steel cooling tower and a stainless steel plate and frame heat exchanger. Although not a top priority the library asked if it would be possible to re-use these recent investments. 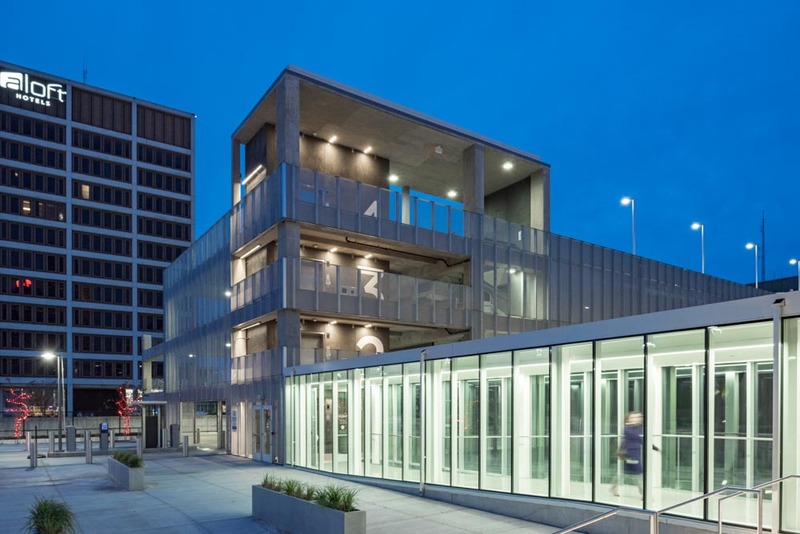 Through multiple design meetings MODUS, MSR and the owner landed on hybrid chilled beam HVAC system. The induction activated chilled beams only required enough ducted air to handle ventilation and latent load (humidity) requirements. The kept ductwork sizes to a minimum and allows the ceiling spaces to remain high. Chilled beams use chilled and hot water as the main energy transport, thus improving overall HVAC efficiency compared to a traditional air heat/cool system. Areas adjacent to exterior doors and spaces with high occupant loads were treated with fan coils with variable speed motors. The cooling tower purchased previously by the library was able to be re-purposed. Slight modifications were made and a remote sump was added. The plate and frame heat exchanger was also re-used as a water-side economizer. During cool weather, the plate and frame heat exchanger can provide the building cooling load without utilizing the chillers, thus saving energy. The library uses three variable speed, frictionless, oil free chillers. Known for their efficiency and quiet operation these chillers serve three systems. Chiller-1: Provides the coldest chilled water for the ventilation units and fan coils. Chiller-2: Provides cool water for the chilled beam system. Chiller-3: Heat Recovery Chiller. The building requires cooling all year. To increase the overall mechanical system efficiency this chiller is able to transport energy from the interior zones to the exterior zones. During colder weather seasons, this heat recovery chiller is able to heat and cool the building without the cooling tower or boilers. The hot water system is served by two high efficiency fire tube condensing boilers. To increase the hot water system efficiency, the coils throughout the building are designed for low temperature heating (130 degrees F). The building ventilation system is served by two energy recovery ventilators. Each unit has a total heat recovery enthalpy wheel and a reheat sensible wheel. To avoid sub-cooling, the sensible wheel is able to re-heat the ventilation air using the excess energy from the building’s exhaust air. This eliminates the need for a hot water or electric coil and saves even more energy. The Library’s electrical system was original to the 1963 construction and needed a full replacement. The electrical design challenges were similar to the mechanical challenges. 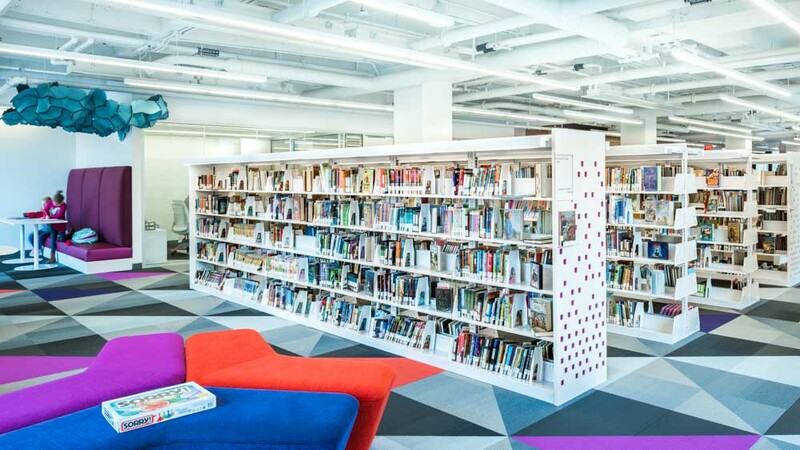 The library placed emphasis on high ceilings and the desire to keep electrical equipment mostly centralized. To help keep ceilings high a raised access floor was utilized to allow all power and low voltage raceway to pass below. This allowed the ceiling plenums to stay dedicated to HVAC and lighting fixtures. The added benefit of the raised floor system was flexibility. As the purpose of libraries continues to evolve, the owner wished to keep floorplans flexible. The underfloor power distribution system provides that flexibility and these changes can occur easily without the need to cut and patch walls and ceilings. To help maximize the overall building efficiency MODUS focused on lighting controls. All perimeter spaces utilize daylight harvesting to ensure light fixtures are only on when needed. Each space contains its own occupancy sensor to avoid using the lights when the space is vacant. A building wide Lighting Automation System allows the owner to graphically see the entire building and control the lights in each zone. Maintenance personnel are able to log-in to the system and monitor each space and place over-rides on specific zones in order to save as much energy as possible. 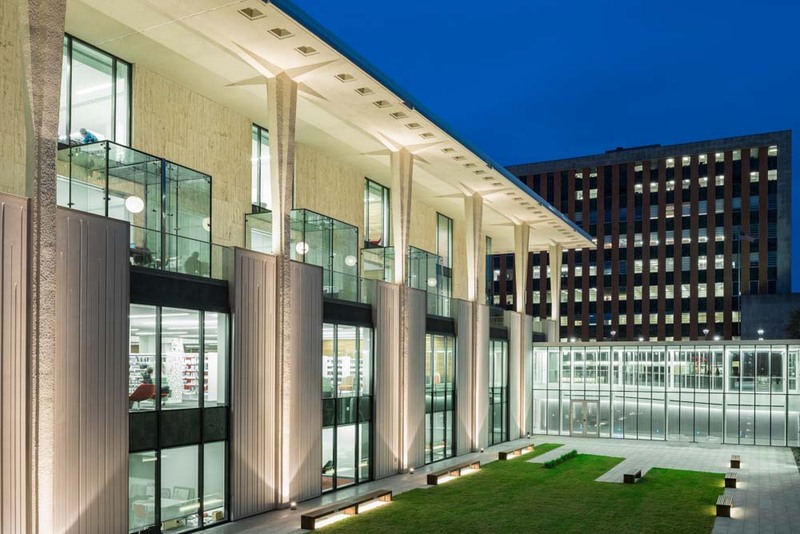 The Central Library required the use of several types of fire suppression systems. The majority of the building is served by traditional wet pipe suppression. Due to high value Audio/Video equipment, two pre-action (single interlock) systems were also designed to help project equipment from accidental discharge. The small covered loading dock is served by an anti-freeze loop. Possibly, the most delicate area concerning fire suppression is the main server room. The Central Library server room serves as the main hub for dozens of branch libraries throughout the city and county. To protect this investment, a clean agent, non-water based suppressions system was designed. In the event of heat or smoke detection, the system will disperse the clean agent to extinguish the fire source without damaging the server equipment.